Judah Benjamin was a lawyer and wealthy planter from Louisiana who was elected to the U.S. Senate in 1852 and resigned in 1861. He was appointed by Jefferson Davis as Attorney General of the C.S.A., then C.S.A. Secretary of War, and finally as C.S.A. Secretary of State. He tried to gain recognition for the Confederacy from France and the U.K. but was unsuccessful. Towards the end of the war, he advocated freeing and arming slaves. When the Confederate capital fell in 1865, he fled to Great Britain and became a barrister. This Judah Benjamin mug is part of our Civil War Series profiling participants in the War Between the States. Thousands of Confederate and Union soldiers fought in battles such as Bull Run, Antietam, Fredericksburg, Chancellorsville, Gettysburg, Vicksburg, Chattanooga, Cold Harbor and Petersburg. We honor their sacrifices by telling their stories. This George Pickett mug is part of our collection of Civil War biographical mugs. An image of George Pickett and a short biography are features of this history mug. 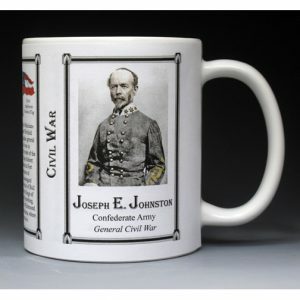 This Joseph Johnston mug is part of our collection of Civil War biographical mugs. 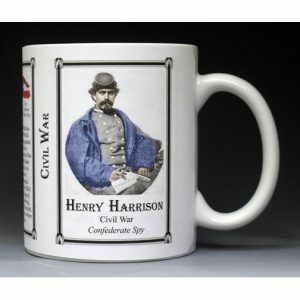 An image of Joseph Johnston and a short biography are features of this history mug.